The older I get, and the longer I work in the Graphic Design profession, the more I come to realize that “plum jobs”—those projects that one can only dream about—don’t come around every day. This may seem very obvious, but the further one gets from design school—where at times the only creative restriction on a student’s project is his or her own imagination—the more one realizes that sometimes the challenges of a day job are to maintain interest and excitement in the project at hand. This is the story of an interesting twist on a very novel project that had a somewhat bumpy—although ultimately, successful—conclusion. These were the words uttered by Greg Potts, Director of Admissions at Philadelphia University—a small, private university in Philadelphia, Pennsylvania—to me, Frank Baseman, Associate Professor and Director of the Graphic Design Communication program at Philadelphia University. Greg wanted to produce a promotional piece; he was looking for a “premium giveaway piece to impress a prospective student,” something that would be guaranteed to elicit a “Wow! This is cool!” reaction, and have the piece branded back to Philadelphia University. He was looking for something special, something different. Greg mentioned a deck of playing cards, and thus the Philadelphia University Admissions Deck of Playing Cards project was born. Admittedly, it was difficult to turn down a rare offer such as this, so I agreed to feature the project in the Philadelphia University Design Workshop course during the Spring 2013 semester. The Philadelphia University Design Workshop is a design course that I teach where students work on real projects for real clients. 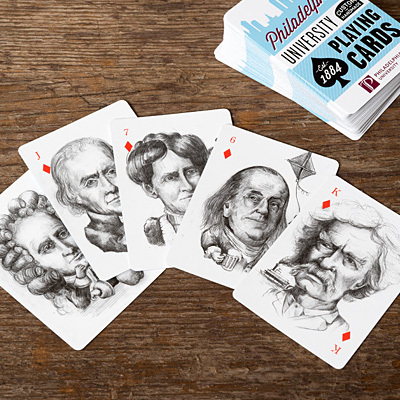 With the Philadelphia University Admissions Office as the client, four Graphic Design students were recruited to work together on the Deck of Cards project. I could sense from the beginning that the project had great original image-making potential, so I consulted with Adjunct Professor Mario Zucca—who teaches the Illustration course at PhilaU—about recommendations for the Deck of Playing Cards project. Mario recommended several students and I approached them about working on the project. Mario continued to serve as “Illustration Guru” and a valuable consultant throughout the run of the project. That’s when this proverbial house of cards almost began to collapse. The first gust of wind was an email from Nikki that queried, “Our lawyers were asking if you had the rights to reproduce the likeness of Albert Einstein?” in reference to Dan Dinsmore’s suit of Diamonds with illustrations of famous innovators throughout time. WHAT? This caught me completely off guard. Between Mario and myself we probably have over fifty years of industry experience—Mario as a professional illustrator and I as a former Art Director at a magazine and studios who have hired countless illustrators through the years. Neither one of us ever saw this coming. After many queries to get to the bottom of the problem, since the playing cards were for promotional purposes and not editorial, we needed to negotiate with the estates of these well-known figures to gain permission to use their likenesses. Fortuitously, one of my best friends is a picture researcher and within a few clicks she directed me to the website that represented the interests of Amelia Earhart and Jackie Robinson (two of our original innovators in the Diamonds suit). After a few emails back and forth explaining the project to the representatives, I received an initial quote of $1,000 a piece to use the likenesses. Working for a non-profit institution, there simply was no way we had that much money in the budget—heck, there was no budget at all!—to pay for reproduction rights. So we were back to the drawing board to try to save the project. It was then that we realized that we had to use figures that were already in the public domain. For me, one of the best parts of the project occurred around mid-semester when as a group the students were trying to decide which famous innovators throughout time would survive the cut, and which ones would be voted off the island. The students were advocating for diversity of background, profession, race and gender, and so they chose to include people like Steve Jobs, Coco Chanel, Jimi Hendrix, Maya Angelou, and the aforementioned Amelia Earhart. Martin Luther King would be the King and Jackie Robinson would be the Jack (naturally). This made for a very lively discussion and debate, and I remember remarking what a fun class period that was. But, now that we were relegated to using only figures within the public domain, out of the original suit of Diamonds only five cards were safe: Ben Franklin; Vincent van Gogh; Thomas Edison; the benefactor, Maurice Kanbar; and Dan’s Joker self-portait (each student did a self-portrait that also served as a Joker of their respective suit). That meant that nine new portraits of well-known innovators in the public domain needed to be drawn. We went back and forth researching which figures to use and Dan Dinsmore, the very talented illustrator of this suit, drew the nine new portraits including Clara Barton, Leonardo da Vinci and Mark Twain. In the end, it was a setback and a compromise—and most people wouldn’t know what was left on the cutting room floor—but we were able to keep the project moving forward. By mid-summer, we had revised final files ready for production to send to Nikki and the U.S. Playing Card Company. Shipment of the decks of cards was in time for the new school year. I was blown away when I saw the finished product! It’s too trite to say that it was awesome—but it really was. When I received the samples I carried them around with me for days: I showed my students, I showed my colleagues, I showed my family. And then when the shipment came in I strutted around campus delivering them to key people involved in the project. They were so real! After working in the Graphic Design industry for over three decades, the excitement never gets old when we make things and they actually go into production. I give huge credit to Greg Potts for coming up with the idea to do a deck of cards in the first place, for being brave enough to work with us, and especially for giving us a great amount of creative freedom. In the end, the Philadelphia University Admissions Playing Card project did everything that we wanted the project to do. It never fails to elicit a “Wow! This is cool!” response from everyone I have shown them to, and they brand back to Philadelphia University, a special place that allows students the chance to work on real-world, collaborative projects such as this. It rarely gets any better than this!